The first program focused on honing students’ observation skills through games, bird identification, and journaling. Due to the advice of some rangers at Cobscook Bay State Park, they explored some of the campground roads where unique birds had been recently sighted. They learned about where birds are likely to be found, heard pileated woodpeckers, oven birds, and black-throated green warblers, and drew and wrote about the birds they observed. Students reflected that they liked listening to the birds in the park and enjoyed finding some old deer bones as an added bonus! 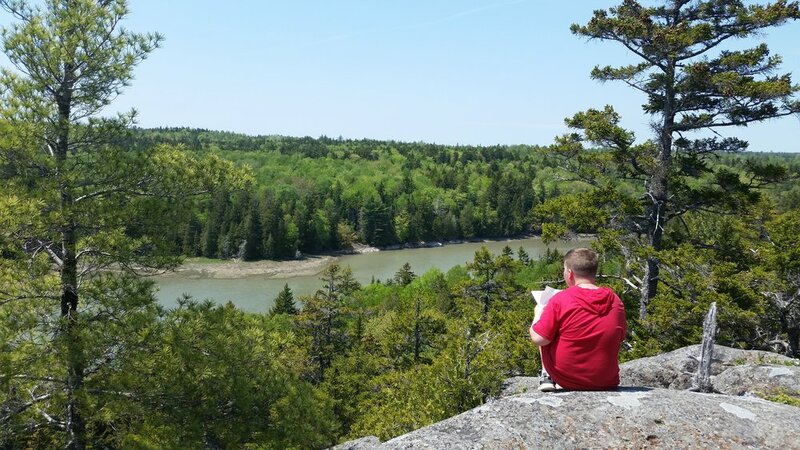 For the second program, students hiked some of the nature trails at Cobscook Bay State Park in order to observe bird behavior and adaptation in action. From a scenic viewpoint, they drew maps of the sounds and sights of birds on the landscape as a bald eagle soared beneath them over the cove. They hiked on and played a game that illustrated how bird bills are adapted to eat certain food types. At the end of the program series, students shared that they liked listening to and finding birds, playing the bird science games, and hiking in between the activities. All students reported that they had fun and learned something, too! Do you know someone who would be interested in MOS programming? Learn more about our Educational Programs and contact us! For more news like this, please sign up for our quarterly e-newsletter here.